The “Bhagwad Gita” is a Hindu scripture containing 700 verses. These verses were sung over 5,000 years ago, by the supreme Lord Shri Krishna to Arjun in the battlefield of “Mahabharat”. Hence the compilation of these verses is called the “Bhagwad (Divine) Gita (lyric)”. 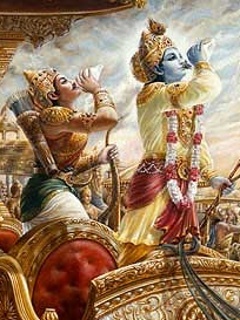 Lord Krishna selected Arjun, a God realized soul from a previous lifetime to be the recipient of this great knowledge. For the benefit of mankind, Lord Krishna concealed Arjun’s true knowledge with His personal power of Yogmaya and secretly placed him at the mental disposition of an ignorant being. Overcome by ignorance, Arjun started asking questions like ordinary material beings. In the modern time, there are many who can read Sanskrit and with the help of literal translation of the verses, they deliver discourses on Gita, but do not follow the teachings of the Gita themselves. There are also others, who recite the verses of the Gita every day and there are children who recite the verses to win numerous Gita recitation contests in schools. Arjun, was the original recipient of this knowledge and fully assimilated the same, hence he is referred to as “Gita-Gyani” (the knower of Gita). Can all the contemporary orators also be called “Gita-Gyani”? Let us reflect on what 'knowing the Gita' means? Arjun went to the battlefield of Mahabharata, however soon developed cold feet, upon seeing his opponents. He got scared of the consequences of killing his near and dear ones, along with all the other respectable warriors. Such was his anguish that after the war was declared and Lord Krishna and all the Pandavas including Arjun, had blown their conch shells (blowing conch shell means starting the war), Arjun refused to fight the battle, ignoring Lord Krishna’s direct instructions to do so. Lord Krishna was stunned to hear about his decision to not fight the battle, as the victory of the Pandavas relied heavily on Arjun. "Arjun! Don’t talk like an impotent in this crucial situation". But Arjun found himself totally incapable of fighting the battle. He started considering every negative consequence of fighting the battle. He started feeling that he had a hidden selfish motive of wanting to be the ruler of the kingdom, behind agreeing to fight the battle. He believed that due to this selfishness he would go down in history as the greatest sinner. 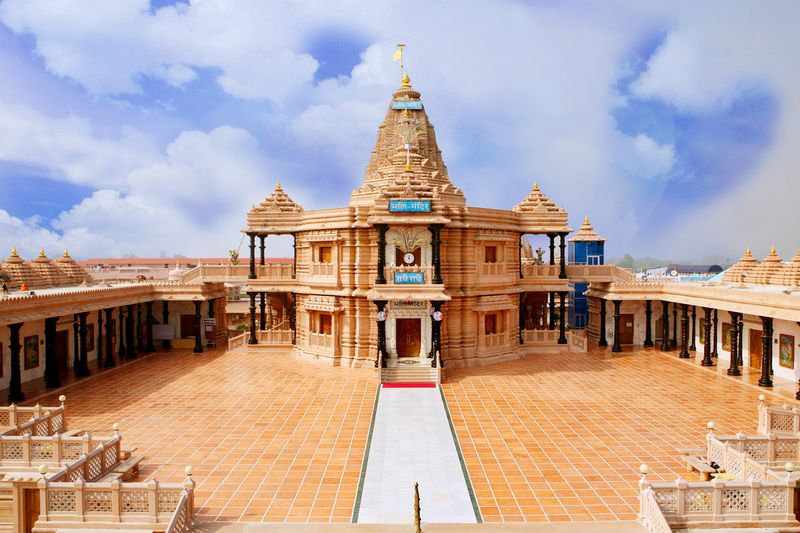 Now the stage was set for the teachings of the Gita in the holy land of Kurukshetra. This teaching was conveyed by Lord Krishna to the world using Arjun as the means, in the form of Question-Answer for ease of understanding. Lord Krishna explained to him, the immortal nature of the divine soul and transience of the material body. He further explained to Arjun the theory of Karma, Gyan, Yog and Bhakti and their characteristics and benefits. He also showed Arjun His ultimate divine form. Thus, eventually He explained to Arjun that there is exclusively only one way to attain eternal happiness i.e. “Forget about all other material duties, as they ultimately result in sufferings. Surrender yourself unto Me (Supreme Lord, the personified form of unlimited divine bliss) alone”. When a devotee surrenders himself solely unto God, only then does God remove the veil of Maya and the individual soul can see God. At that very moment, God bestows all His Divine powers on the individual soul. This is the end of Gita. In other words Arjun heard, assimilated and reached a conclusion. Thus, his life was totally changed and he attained the ultimate goal of life. Abandon all kinds of religions and surrender yourself unto Me alone. I shall deliver you from the results of all sinful actions committed in the past. Do not fear. Lord Krishna also explained how to do that. yatkaroshi yadashnaasi yajjuhoshi dadaasi yat . "Whatever you do, whatever you eat, whatever you offer or give away, and whatever austerities you perform - do that, as an offering only to Me - Shri Krishna". yet lead the same material life and not even try to surrender our mind to Lord Krishna, then what is the point of repeating these words every day? Lord Krishna had said these words to Arjun, but when we recite the verses of the Gita every day, who are we saying this to? There should be a purpose behind every action of a rational person. We are supposed to read the verse once or twice, then contemplate on what Lord Krishna is saying in that verse and then practice to do it. During Mahaprabhu Chiatanya’s time, there was a devotee, who did not know how to read and pronounce Sanskrit words properly. Yet, he used to read the Gita every day. One day another devotee informed Mahaprabhu Ji that a man, who has no knowledge of Sanskrit, mutilates God’s words said in the Gita. Mahaprabhu Ji called him and asked, “Do you know Sanskrit”? He said “no”. Mahaprabhu Ji further asked, “then what do you do while reading”? 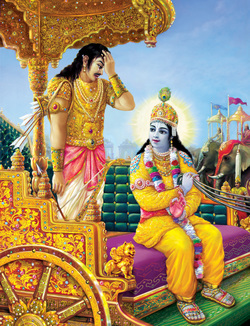 He said, I visualize Lord Shri Krishna sitting on his chariot and giving a lecture to Arjun who is sitting reverently at His lotus feet and listening to those words. Mahaprabhu Ji was delighted upon hearing this and embraced that devotee. He said this is exactly what Gita says "Remember God". This man has understood the essence of Gita. Anybody who does not remember God constantly and claims to know the Gita and follow the teachings of Gita is an imposter. So, the measure of one’s knowledge of the Gita is proportionate to the percentage of one’s surrender to God. The percentage of surrender is directly proportional to one’s detachment from this world. Thus, a mere reader or orator of the Gita, being a servant of his own material desires is not “Gita-Gyani”. A “Gita-Gyani” is one who loves Shri Krishna wholeheartedly and whose mind remains constantly absorbed in the thoughts of Lord Shri Krishna and all his actions are for pleasing only Him. Thus, a mere reader or orator of Gita, being a servant of his own material desires is not “Gita-Gyani”. A “Gita-Gyani” is one who loves Shri Krishna wholeheartedly and whose mind remains constantly absorbed in the thoughts of Lord Shri Krishna and all his actions are for pleasing only Him.